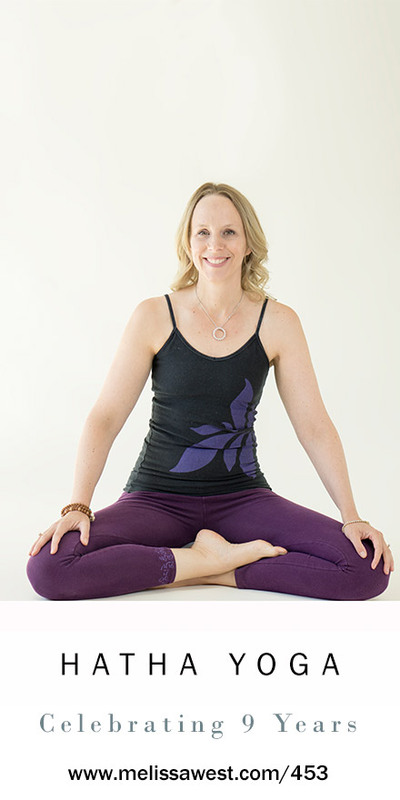 To celebrate nine years of Yoga with Melissa we will practice a Hatha Yoga Class for Gratitude with a focus on the first of the four reminders in Buddhist practice: Precious Human Life. We have been born at the most incredible time with access to a wonderful platform called YouTube. This platform has allowed us to come together for the last nine years and share in the teachings of yoga. We have enough time in our lives to practice and we have access to an abundance of teachings, more than we could probably ever complete in a lifetime. We live in a place where there is enough peace and we are not fearful to engage in these practices in our homes. We have enough food in our bellies to give us the energy to practice. We are healthy enough in mind and body that we can engage in these yoga practices. This hatha yoga practice will release your shoulders and hips, open your heart, chest and side body, focus on balance, strengthen and lengthen your and bring flexibility and mobility to your spine. The hatha yoga class will combine elements of qi gong and natural movement for mobility, functional movement and to infuse our practice with prana, chi or life force energy. In in Buddhist practice there is something called the four reminders or the four preliminaries. The first reminder is this precious human life or as my teacher Reggie Ray says, this precious human opportunity. They speak to the freedoms and advantages of our precious human birth. These teachings touch me incredibly deeply especially as I reflect back on our last nine years together and this precious opportunity that we have and continue to have to practice yoga together here on this platform. It has been a unique chance to create and collaborate with all of you something special with our lives through a meditative, spiritual and contemplative practice. We each have been given enough health and energy to be able to practice yoga. There are many people in our world that are so debilitated physically, mentally, and emotionally that it is not possible for them to participate in these practices. For that we are incredibly blessed. We each have the ability to think and feel freely. This means you can press mute if you think I talk too much, choose another channel if you do not agree with the teachings or even want to hear teachings. And that being said, those of you who have decided to stay, we have been incredibly blessed to have teachers who have been generous enough to share the teachings of yoga, to pass them down through the generations, that they has travelled through the world and into our lives and countries in a forms that we can understand and accept. This is another blessing. We each have been given enough food and money to meet our needs, including internet connection so that we can download our yoga classes each week and a space to practice in our homes. We live in countries that are free from war and oppression that mean that we can practice freely without fear. We can be grateful that through the internet we have been connected, teacher, student, community and that together we support each other in the practice of yoga. Our community supports each other with acceptance, loving kindness and encouragement, knowing that each one of us has access to our own embodied wisdom. Nine years of making the most of these opportunities. Nine years practicing yoga with the fullness of awareness as thoroughly as we can in this medium. That is the first reminder. That is this precious human life. That is why I am grateful to be alive and connected with all of you at this time. May we continue to grow in this precious opportunity together.